What happens before rhinoplasty surgery? What happens the day of Rhinoplasty Surgery? What is the post-operative care for rhinoplasty? What are the risks and complications of rhinoplasty? These procedures are done to change, correct, or repair the nose. A thorough discussion of the patient's goals, anticipated results, and possible surgical limitations is an essential part of pre-surgical planning. Surgery is usually done in an outpatient surgicenter facility under anesthesia. Assistance is required for the first day after surgery. Several office visits for nose care and optimal results will be necessary following surgery. Rhinoplasty is a facial cosmetic procedure, usually performed to enhance the appearance or reconstruct the nose. During rhinoplasty, the nasal cartilages and bones are modified, or tissue is added, to improve the visual appeal of the nose. Rhinoplasty is also frequently performed to repair nasal fractures. When rhinoplasty is used to repair nasal fractures, the goal is to restore pre-injury appearance of the nose. Septorhinoplasty is a related procedure performed for patients who also have nasal obstruction. Septorhinoplasty not only improves the appearance of the nose, but it removes any internal obstructions and stabilizes structures that may be blocking nasal breathing. Cosmetic concerns and expectations should be fully discussed prior to surgery. The surgeon's recommendations and any particular limitations set forth by the structure of your nose, face, and skin are important to understand and have explained. Photographs (without make-up) are usually obtained before surgery to help with preoperative planning and after surgery to document postoperative results. In most situations, the surgery is performed as an outpatient at either the hospital or the surgicenter. In both facilities, quality care can be provided without the expense and inconvenience of an overnight stay. An anesthesiologist is present for monitoring vital functions throughout the procedure. Usually, the anesthesiologist will call the night before surgery to review the medical history. Preoperative laboratory studies will need to be done several days in advance. Transportation after the procedure will need to be arranged and someone should stay with the patient during the first night. Aspirin, or any product containing aspirin, should not be taken within 10 days of the date of surgery. Non-steroidal anti-inflammatory medications (such as Advil, Motrin, Naprosyn) should not be taken within 7 days of the date of surgery. Many over-the-counter products contain aspirin or Advil type drugs so it is important to check all medications carefully. If there is any question, please call the office or consult a pharmacist. Tylenol is an acceptable pain reliever. Prescriptions for pain medications are usually written prior to the date of surgery and should be filled in advance. No food or liquids should be consumed within 6 hours prior to the time of surgery. This includes even water, candy, or chewing gum. Anything in the stomach increases the chances of an anesthetic complication. Smokers should make every effort to stop smoking, or at least reduce the number of cigarettes. This will help to reduce postoperative coughing and bleeding. Difficulty with tissue healing has also been noted in smokers during the postoperative period. Any illness prior to the day of surgery should be reported to the surgeon's office as soon as possible. If illness occurs the day of surgery it is best to proceed to the surgical facility as planned and be evaluated to decide if surgery is safe. It is important to check in with the surgical facility on time. Bring all papers and forms including any preoperative orders and history sheets. Wear comfortable loose fitting clothes that do not have to be pulled over the head. Leave all jewelry and valuables at home. Remove all make-up with a cleansing cream. Thoroughly wash the face with soap and water and do not apply makeup or creams. Do not take any medication unless instructed to do so. Usually, a nurse will start an intravenous infusion line (IV) in the pre-operative holding room and a medication may be given for relaxation. In the operating room, the anesthesiologist will usually use a mixture of a gas and an intravenous medication. Continuous monitoring during the procedure usually includes a pulse oximeter (oxygen saturation) and EKG (cardiac rhythm). The surgical team is prepared for any emergency. In addition to the surgeon and the anesthesiologist, there will be a nurse and a surgical technician in the room. Depending on what is required and what additional procedures are performed, the surgery may take one to several hours. The surgeon normally talks with any family or friends once the patient is safely in the recovery room. Patients are monitored after surgery in the recovery room by a nurse. A patient is able to go home the same day as the surgery once fully recovered from the anesthetic. This usually takes several hours. Transportation home will need to be arranged. A responsible adult should be in the same residence overnight for help on short notice. At home the patient should have bed rest with the head elevated on 2-3 pillows. Edema and swelling are minimized by keeping the head elevated above the heart. An assistant should be available for out of bed excursions to the bathroom. Straining should be avoided. If constipated, take a stool softener or a gentle laxative. Swelling and bruising of the nose, upper lip, cheeks, or around the eyes for several days after surgery is a normal occurrence. This will gradually go away over the next 7 to 10 days. Ice on the face, bridge of the nose, and eyes as much as tolerated will help to minimize these problems. This will also help with postoperative edema and pain. Some patients have found frozen vegetables in packages (for example, bags of frozen peas) to be a convenient ice pack which conforms to the face. A nasal splint or cast will cover the outside of the nose, and will usually be removed one week following surgery. As swelling subsides, the splint tends to fit less tightly. If the cast gets wet it may come off prematurely; this is usually not a problem and does not affect the outcome of the procedure. Moderate bleeding from the nose is normal, and will gradually decrease. 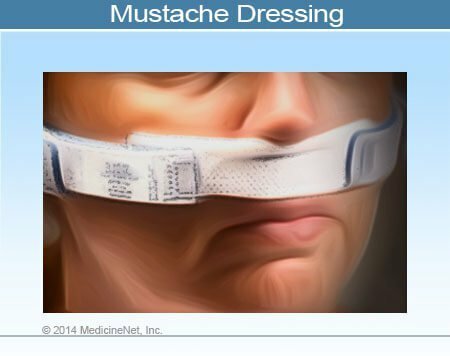 The gauze dressing ("mustache dressing") will collect blood and should be changed only when saturated. It is not unusual to change these dressing every hour during the first 24 hours after surgery. This dressing will usually not be needed after a few days. Do not take aspirin, aspirin-containing medications, or non-steroidal anti-inflammatory medications (such as Advil) for 3 weeks following surgery. It is best to eat a light, soft, and cool diet as tolerated after recovery from the anesthetic. Avoid hot liquids for several days. It is best to go slowly with food immediately after the procedure to prevent postoperative nausea and vomiting. Patients occasionally vomit one or two times immediately after surgery; if it persists, medication to settle the stomach may be prescribed. It is important to remember that a good overall diet with ample rest promotes healing. Antibiotics are prescribed after surgery. It is important to finish all the pills that have been ordered. Some form of a narcotic will also be prescribed (usually vicodin) which is to be taken as needed. If narcotics are taken, it is important not to drive or engage in activities where impaired judgment could cause injury. In some situations steroids may be prescribed to be taken either preoperatively and/or postoperatively. It is very important to take this medication as prescribed, and not discontinue it prematurely. An anti-emesis medication such as phenergan may be prescribed for nausea or vomiting postoperatively. Possible drug reactions to any of these medications, such as a rash, should be reported to the doctor as soon as noticed. No other medications, either prescribed or over-the- counter, should be taken without the knowledge of your doctor. In most situations, packs will have been placed in the nose to control postoperative bleeding. The packing material will be removed at a scheduled postoperative visit. Arrangements should be made for someone else to drive to and from the office for this first visit. Eat a light meal before this visit and avoid taking excessive pain medications. Immediately after the nasal packs are removed, a saline nasal spray such as "Ocean Spray" is used several times per day to prevent crusts from forming in the nose. Several subsequent office visits are necessary to assess healing, remove crusts, and ensure a speedy recovery. The nose is usually tender after surgery, so a spray of special numbing medication is used before removing crusts. After the packing has been removed, breathing through the nose is acceptable, but do not blow or sneeze through it for 7-10 days. Any sneezes should be channeled through the open mouth. Expect some light blood-tinged drainage from the nose for several days. If bleeding becomes excessive, apply ice and rest quietly with head elevated while holding the nose. If bleeding continues, call the doctor. Rest for the first week following surgery. Avoid excessive talking, smiling, hard chewing, strenuous activities, lifting heavy objects, bumping the nose, and bending over. Try not to rest glasses on the bridge of the nose until soreness and swelling subside. Contact lenses can be worn once eye swelling and any irritation have resolved. Alcohol and tobacco should be avoided because they may prolong swelling and healing. Smoke, dust, and fumes may irritate the nose and cause an infection. Facial tanning is discouraged for 6 months after surgery. Number 15 or greater sun block is recommended during any sun exposure. Make-up may be worn anytime after surgery. Lubricate the nostrils, as instructed, with a Q-tip and Vaseline to soften harden crusts. Peroxide helps to loosen crusts. After several days a few of the absorbable sutures may become noticeable. Be gentle while brushing the upper teeth. They will often be tender for several weeks, and there may some numbness of the teeth and palate for several months. Exercise and swimming may be resumed after 3 weeks if there are no bleeding problems. Diving should be postponed for two months. It is advisable not to schedule travel for three weeks following surgery to allow for proper postoperative recovery and healing. A sudden increase in the amount of bleeding from the nose unrelieved by pressure, ice, and head elevation. A fever greater than 101.5 degrees F which persists despite increasing the amount of fluid intake and Tylenol. A person with a fever should try to drink approximately one cup of fluid each waking hour. Persistent sharp pains or a headache that is not relieved by the prescribed pain medication. Increased swelling or redness of the nose or eyes. This surgery, like any surgery, may involve risks of unsuccessful results, complications, or injury from both known and unforeseen causes. Because individuals differ in their response to surgery, their anesthetic reactions, and their healing outcomes, ultimately there can be no guarantee made as to the results or potential complications. The following complications have been reported in the medical literature. This list is not meant to be inclusive of every possible complication. Although many of these complications are rare, all have occurred at one time or another in the hands of experienced surgeons practicing the standard of community care. Nasal obstruction due to failure to straighten the septum or later re-deviation of the septum, collapse of the nasal cartilage, or the re-growth or swelling of the turbinates. Failure to resolve coexisting sinus infections, or recurrence of coexisting sinus problems and/or polyps, or the need for further or more aggressive surgery. In rare situations, bleeding can lead to a need for blood products or a blood transfusion. Autologous (self-donated) or designated donor blood may be arranged in advance in case an emergency transfusion is necessary. Chronic nasal drainage or excessive dryness or crusting of the nose or sinuses. Need for allergy evaluation, treatments, or environmental controls. Surgery is not a cure for or a substitute for good allergy control or treatment. A cosmetic result that does not meet expectations; possible need for revision surgery. Failure to resolve associated "sinus or nasal" headaches. The exact cause of headaches can be difficult to determine or be from many different causes. A consultation with another specialist such as a neurologist may be necessary. Damage to the eye and associated structures (rare). Permanent numbness of the upper teeth, palate, or face. Septal perforation (a permanent hole inside the nose between the two sides). Failure to restore or worsening of the sense of smell or taste, or failure to relieve nosebleeds. Thinking about getting cosmetic surgery? Check out before and after pictures of popular cosmetic surgery procedures, including: liposuction, tummy tuck, breast implants, rhinoplasty (nose job), neck lift, and more. Why did you decide to have rhinoplasty? Please share your experience. What is it like to have rhinoplasty surgery? Describe your experience, including recovery and results. The most common cause of a black eye a trauma injury to the face or head. Most black eyes are minor and heal on their own; however, some may lead to significant injury. In addition to trauma to the face, cosmetic surgery can cause a black eye(s) as a side effect. People should be aware of the situations in which medical care should be sought immediately for a black eye.